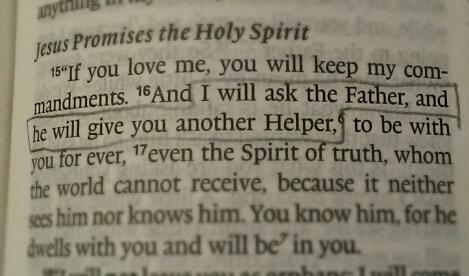 Even Jesus had to pray for things he knew God was going to do – he had total assurance that the Holy Spirit would be sent (and in fact talks about him in the present tense in v17), but he still has to ask the Father. Prayer is such a mystery, isn’t it? I’m often tempted to think I don’t really need to pray as God’s will will be done anyway – why would the almighty God be swayed by my little prayers? But Jesus wasn’t trying to change God’s mind, just asking for that which was already planned. 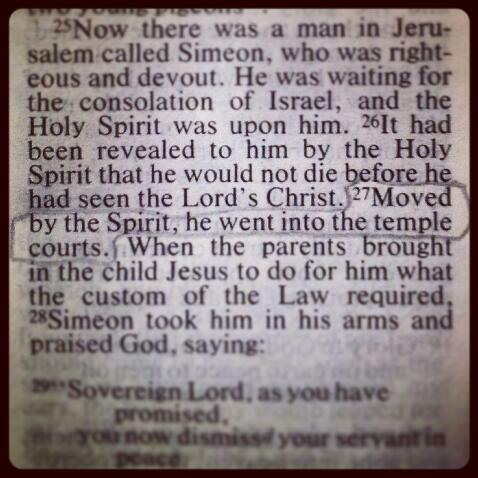 “The Lord came and stood there.” What an incredible thing that must have been. 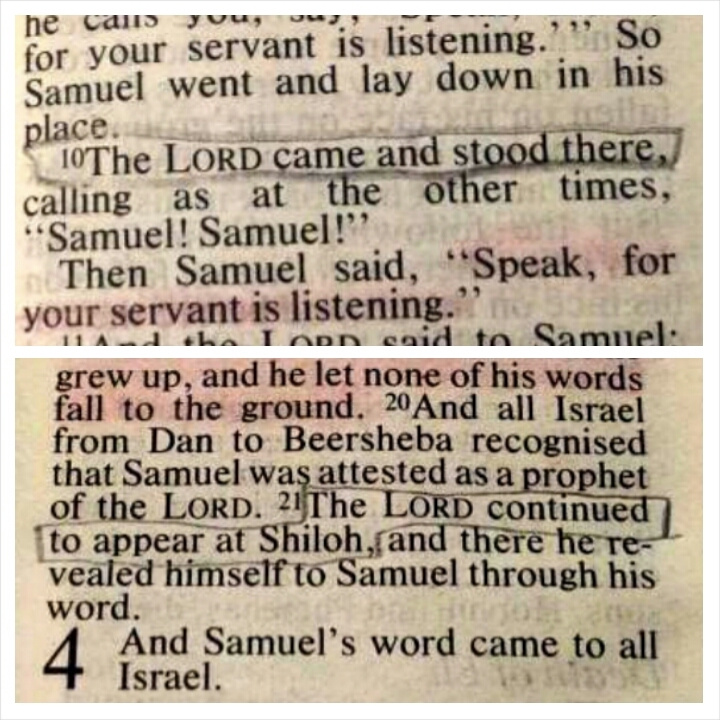 We don’t get any sense of fear from Samuel, even though the first verse of the chapter makes it clear that this would not have been a normal occurrence in Israel at the time. What a privilege to see God! What an honour to be one of the few people in the whole of God’s chosen nation to whom he chose to reveal himself and to speak! Let’s watch as we go through the books of 1 and 2 Samuel together, but unless I’ve really not been paying attention, I don’t think this immense privilege led Samuel into any kind of arrogance or sense of entitlement. He was trusted with a special intimacy with God, presumably because God knew he could be trusted to handle it appropriately. The fact that he did is borne out by the fact that God continued to appear and to speak to Samuel. *PS, and that’s why I’m doing this exercise in the first place, to force myself to focus on the text not just let it drift pass my eyes – it’s working! Thank you for joining me on the journey! 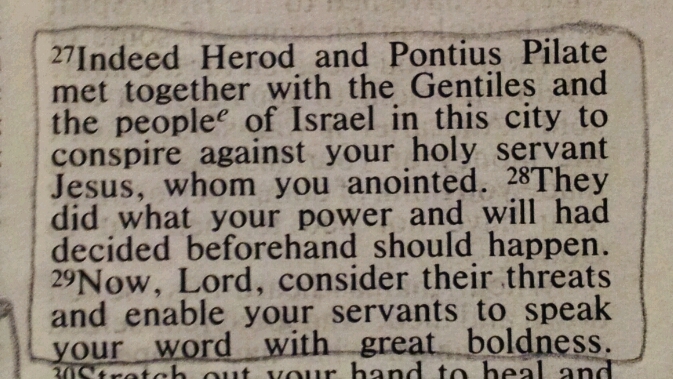 The prayer devotional today sent me to verse 1 of this passage as one of a number speaking about the centrality of prayer in the early church. Yet this passage doesn’t talk about the effects of any specific prayers. Peter and John were on their way to the temple at prayer time, presumably intending to pray, but we are not told of any pre-existing prayers. The end of the previous chapter talks about the believers all being together, devoting themselves to the apostles’ teaching and to prayer, so I think we understand that Peter and John were living in a state of ongoing prayerfulness, and it is that which forms the backdrop to this story. It’s another of those very familiar incidents which I’ve just noticed something new about. 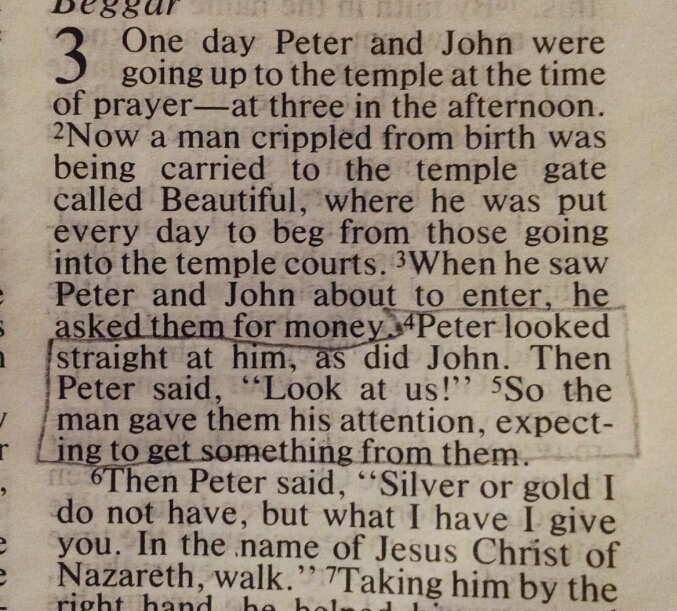 Look at the verses outlined above – the beggar asked for money, both Peter and John looked straight at him, but then they had to tell him to look at them. I’ve always pictured this as the beggar having done something particular to get their attention, which in my culture includes making eye contact. I’ve imagined dozens of blind, lame or otherwise needy beggars sitting along the side of the path all calling out, and this one somehow managing to catch Peter and John’s eye and make his case. Yet it seems that that’s not quite how it worked. He hadn’t particularly honed in on them, but they somehow were both prompted to look at him – presumably because of this atmosphere of prayerfulness they lived in. He wasn’t particularly expectant. He hadn’t singled them out as potential answers to his problem, but God had singled him out as the person to be helped that day. Why? We’ll never know – at least this side of eternity – but it served as another reminder for me of something I’ve written about before: the more we’re immersed in God and in prayer, the more he is able to speak to us and bring to our attention situations he wants to change and needs he wants to meet. 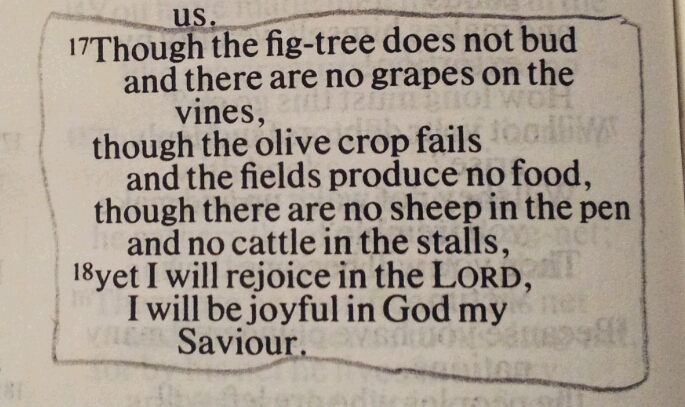 A double-whammy today, about persistence in prayer. The devotional I’m reading sent me first to the story of Jacob wrestling with the angel and was talking about the importance of persistence in prayer. 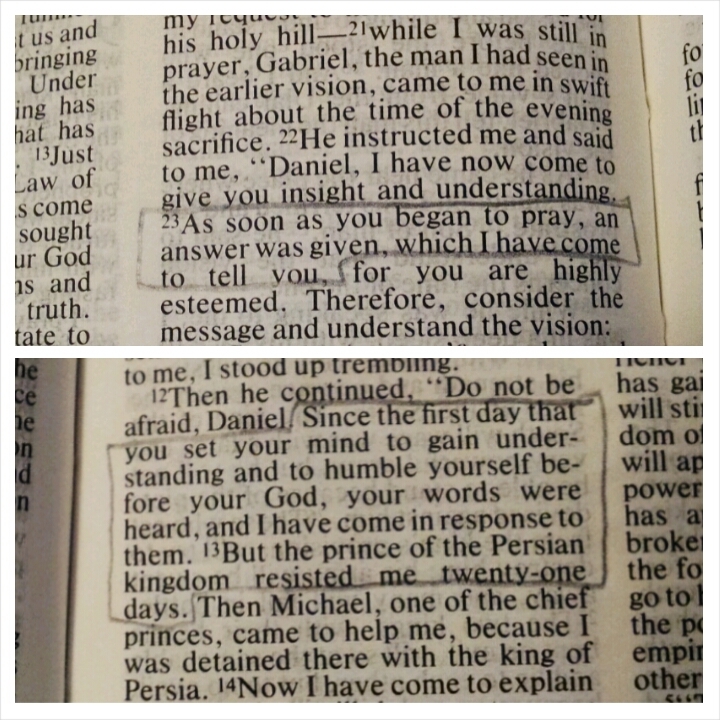 Then it took me to Daniel and the passages in which these 2 verses appear. I think it’s one of those mysteries we’re never going to be able to fathom, isn’t it? God wants us to be persistent in prayer, but then (sometimes) assures us that our prayer was answered from the first moment we asked. I suppose it doesn’t help that we are time-bound people dealing with a timeless God – he knows from the moment we start praying how persistent we are going to be and how fervently we want the thing, so he answers then on the basis that we will keep praying for a long time before he answers. Then add to that the angels sometimes getting caught for longer than they expected on a task, and who knows when our prayers will get answered (I wonder what Jacob’s angel was supposed to be doing when he was delayed by Jacob!). Clearly the only solution is to keep praying and not be discouraged, because we have no idea what is happening behind the scenes! Another random reading from the prayer devotional, which I may work through for a bit, so I’ll stop apologising for not reading my way through one Bible book! I’ve been talking on and off to a friend recently about being more open and responsive to the promptings of the Holy Spirit – we’ve both had occasions when we’ve ‘randomly’ contacted someone at just the right time, or seen God working in similar ‘coincidences’. This must be one of the coolest ever, though, mustn’t it? ‘Moved by the Spirit, he went into the temple courts,’ and the thing he had been waiting for all his life was fulfilled – and probably in a more incredible way than he had ever dreamed! How amazing! Wouldn’t it be wonderful to have that kind of relationship with God that his Spirit could lead you that easily and reveal the truth to you that clearly? I find that so inspiring!